Hi, welcome to the beginning of the new look Rowes. We've been part of the Toowoomba community for a very long time, since 1892 in fact. We're no new kids on the block. But, today we are a new generation, and we're looking forward to serving this generation of residents, as well as the next, and hopefully even the generation after that. We're really proud to have been furnishing homes in the Darling Downs for such a long time. We're proud of where we've come from, who got us there, and where we're going next. Over the years, we've evolved as the community has. Did you know that in the 40's, Rowes once housed a roller skating rink? At that time, fun was needed more than furniture. Yes, we've been there through a lot. As time moved on, and Toowoomba continued to grow, so did our store - into the generous store front it is today. 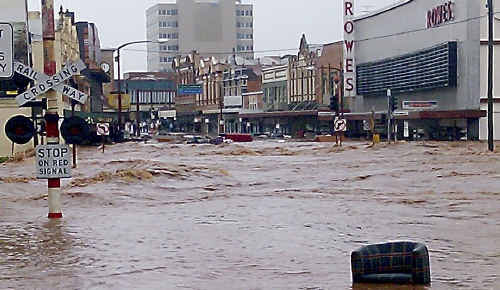 The flood in January, 2011 was a major event in many lives for those living in Toowoomba. Our store was inundated, the staff running out as the flood waters rushed in. It was a close one. But, you as a community came and supported us, helping us clean up and open our doors again. And we were, and are, so thankful. Together, we pulled through. In the next little while you might notice a few changes around the store. We're going to be freshening up a little, giving our beloved store a bit of tender, loving care. We're creating a dedicated Australian Made section so you can support local manufacturers. Because supporting each other is important. We're also changing our look a little, as a way to pay homage to where we have come from, and where it all began. We're looking back, whilst moving forward with you. It's important to us to keep our old fashioned, family values (we're still run by the same family, since the beginning, and in this day and age that's a rare thing). We love our quality products, especially those super comfortable recliners and lounge suites, and we think you'll love our great prices. If it's been a while since you've visited us, came say hello. We'd love to see you. You can join our email list and we'll let you know when we've got something special happening in store. We look forward to continuing to serve you as a community, now and into the future.